The Joint Security Area (JSA) is the only portion of the Korean Demilitarized Zone (DMZ) where South and North Korean forces stand face-to-face. It is often called the "Truce Village" in both the media and various military accounts. The JSA is used by the two Koreas for diplomatic engagements and, until March 1991, was also the site of military negotiations between North Korea and the United Nations Command (UNC). 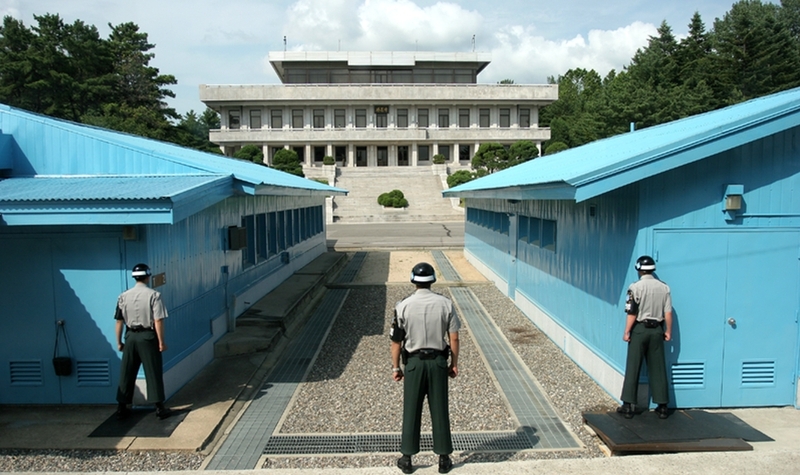 The Joint Security Area is located at lying within the village of Panmunjom. The original village of Panmunjom encompassed a larger area than the current inter-military complex of the JSA, and consisted mostly of farms. The JSA itself is actually about 800 meters (½ mile) south of where the village proper used to be, though still within the village's old farming area. It is because of this proximity that there is often ambiguity between the terms JSA or Panmunjom. Panmunjom no longer exists as an inhabited village as it was destroyed during the war, and all that now remains on the site of the village is the North Korea Peace Museum. Residing within the North Korean half of the DMZ where civilians are not allowed, the village has not been rebuilt or repopulated, but the name carries on and the name is now used to usually refer to the JSA. The village gained lasting fame as the site where the Korean Armistice Agreement was negotiated. General Nam Il and General Harrison signed the armistice agreement at 10:00 am on July 27, 1953, in a hastily constructed pavilion at Panmunjom. General Mark W. Clark, Commander-in-Chief, UNC, later countersigned the document in a separate ceremony at Munsan, approximately 18 kilometers (11 mi) south of the DMZ; and Marshal Kim Il Sung, Korean People's Army (KPA) Supreme Commander, along with Peng Teh-huai, Commander, Chinese People's Volunteer Army (CPV), countersigned it at Kaesong, approximately 10 kilometers (6 mi) to the north in another separate ceremony. The JSA has been the site of numerous major events since its establishment in 1953, the first of which was the repatriation of prisoners of war (POWs) after the cessation of hostilities, across the Bridge of No Return. The JSA is also portrayed in the movie of the same name, Joint Security Area. Originally established as a U.S. Army organization, the JSA quickly incorporated Republic of Korea (ROK) soldiers as Korean Augmentation Troops to the United States Army (KATUSAs) to give South Korea representation in the area as well. Since the signing of the armistice, until relatively recently, the UNC unit (Joint Security Force), charged with providing security for the area, consisted largely of U.S. Army soldiers with a significant contingent of KATUSAs. Today, the unit consists of a U.S. Army Commander, with a largely symbolic operational control of the unit and an ROK Army deputy commander with administrative authority over the largely ROK Army members of the unit. There also continues to be a U.S. Army staff of several officers and a dozen or so NCOs. It had been scheduled that the U.S. Army personnel would leave the facility and hand over full control to ROK Army members by 2008. However, this has not happened as of mid-2011. The Joint Security Area currently has around 100,000 tourists visit each year through several tourism companies and the USO (through the various U.S. military commands in Korea). Before being allowed to enter the DMZ, if visiting from the South, tourists are given a briefing during which they must sign a document which states, in part, "The visit to the Joint Security Area at Panmunjom will entail entry into a hostile area and possibility of injury or death as a direct result of enemy action." Primarily tour companies from South Korea, Japan and the USO conduct tours from the South side. South Korean citizens generally do not accompany foreign tours due to logistics of providing interpreters with the right language for each tour group.